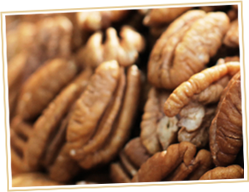 Natural & Roasted Pecans from TUCKER PECAN COMPANY come in pecan halves and pieces fresh from the orchard and are simply irresistible. The TUCKER PECAN COMPANY Cello Bags are a customer favorite. Each 1 lb. 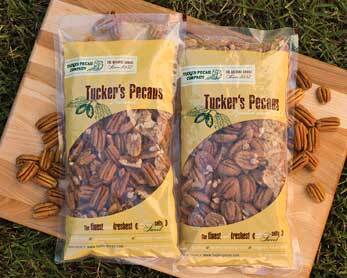 Cello Bag is decorated with the TUCKER PECAN COMPANY logo and is guaranteed fresh upon arrival. *Minimum 2 lb pecan order required for shipping. Pecan Meal - 1 lb. Roasted and Salted Mammoth Halves - 1 lb. Natural Mammoth Pieces - 1 lb. Natural Mammoth Halves - 1 lb.